We learn a lot of information in PT school, and sometimes the entire class will go “WOW!” and freak out about something that is really cool. I wanted to start sharing some things that we learn in school, and I hope that I’m able to explain them well enough for you to understand. In Kinesiology we learned about all the movements at most joints in the body, including the movements at the wrist. 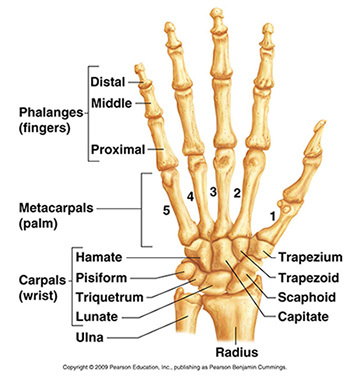 For a quick overview, here are the bones in the hand and wrist. Two movements that you can perform at the wrist are radial and ulnar deviation. This just means that you turn your hand towards your ulna, or towards your radius. To better under this movement, you can place your arm on a table with your palm facing the ceiling. Then move your hand so that your thumb moves closer to your forearm. That is radial deviation, because your radius is on the thumb side of your forearm. If you move your palm so that your pinky is closer to your forearm, that is ulnar deviation. Those are the movements occurring in this Fluouroscopy video. The subject is moving their wrist between ulnar and radial deviation. Try to look at the carpal bones and see what happens when the hand is moving. I know that it might be hard to see, so I took these screenshots and outlined the Scaphoid carpal bone. The left photo shows the wrist ulnarly deviated, as you can see that the hand is moved towards the left, or towards the ulna. The Scaphoid looks like it is elongated. The right photo shows radial deviation. The hand is more tilted towards the right, or towards the radius. It looks like the Scaphoid bone is now squished or not as elongated, right? What is going on here? You probably know that your bones are made of a pretty hard material, so they don’t drastically change sizes when you move. They’re supposed to support you, not turn into Jello. The Scaphoid bone isn’t changing it’s shape, even though it looks like it is. Instead, the Scaphoid is flexing and extending, which makes it appear that it is changing shape. It’s actually changing it’s orientation in the wrist, but it is just difficult to visualize the bone in a 3D way when you’re looking at a 2D video. We usually look at photos and diagrams when we’re learning in class, so it’s always fun to view the body when it’s actually moving.We watched this video for 3-4 minutes during class because we all thought it was so interesting. I hope this wasn’t too complicated, and I hope you found this to be super cool! What interesting things have you learned in school? Share below!